John and Eric have a total of 49 toys. If Eric has 5 more toys than John, how many toys does each one have? 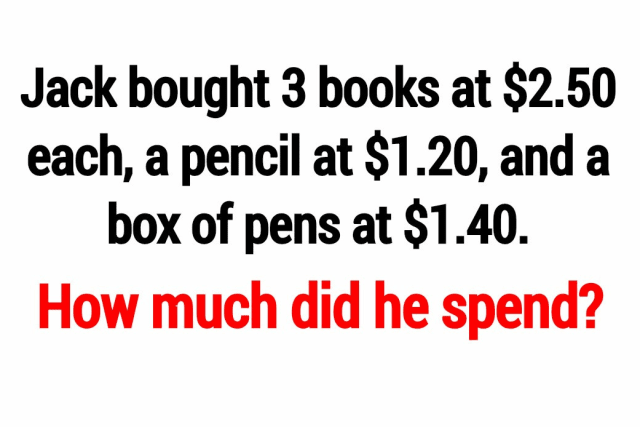 If Jack bought 3 books at $2.50 each, a pencil at $1.20, and a box of pens at $1.40, he spent ____. What color do you get from mixing blue and yellow? What is the process of a gas turning to liquid? Linda can walk 4 miles in one hour. How long does it take her to walk 18 miles? Any number multiplied by 0 is 0. If a large box contains 18 small boxes, and a small box contains 25 candies, a large box contains ____ candies. Which of the following is NOT a mammal? You have the traits of extraordinarily brilliant people! You don’t close yourself off to new ideas, and you always seek out alternate viewpoints. You may seem odd to some, because you have a lot on your mind, you talk to yourself, and you sleep less than others. You're always trying to figure things out and answer complex issues. Keep it up, genius! You're awesome! You are way too artistic and bohemian for this kind of testing. You're more concerned with the deep meaning of life. Good for you!